Acting on a tip off, Police arrested Rabin Darjee(26) of Singtam Sikkim and Fatima Khatun (30) of Malli Kalimpong were held with drugs after police caught them with huge amount of contraband substances this morning at NH 10.Acting on source information Riyang PP OC Sujit Lama and his team arrested both after one Sawari vehicle bearing no. SK-01/J-2600 which they were travelling was stopped for Checking at Suntale . The whole banned materiel was kept near the driver seat in a sack. 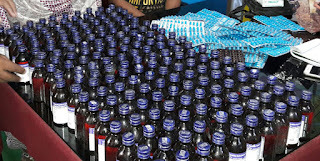 Police recovered 190 bottles of phencyrex cough syrup of 100 ml each, 40 strips of Spasmo Proxyvon capsules and 20 strips of Nitrosun-10) this morning at Suntale under Reang PP NH 10 . 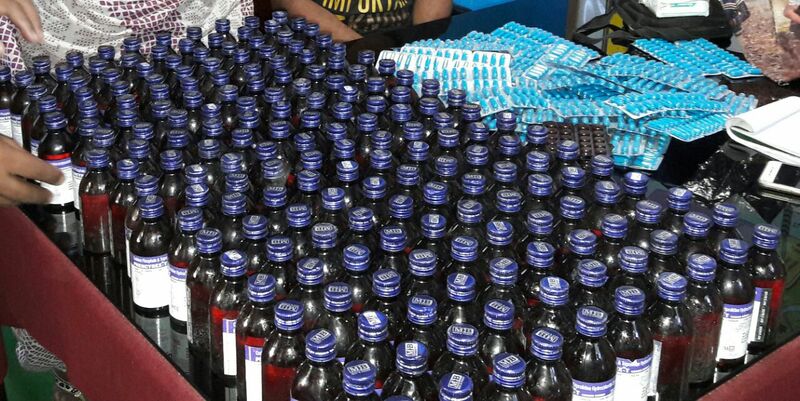 The lady was the owner of the contraband substances. Notably her husband Aslam Mansuri drug peddler is presently also in jail. Both driver and the lady have been booked under W.B drugs and cosmetic act and were forwarded to Kalimpong court. 1 Respones to "Two arrested for peddling drugs"